After updating my monthly net worth spreadsheet I had a look at the 'projection' graph I'd created pre-GFC (as shown below). 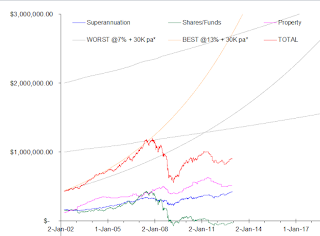 One thing that stands out (apart from the impact of the GFC and EFC on my NW) is that my 'best case' projection of 13% pa ROI (it wasn't quite as silly as it now looks, since it included the effect of ~50% gearing on my 'high risk' asset allocation) was wildly optimistic (no surprise there), and that my 'worst case' projection of 7% ROI was nowhere near reality. A true 'worst case' projection would have been a negative NW (all my assets becomming worthless and still owing money) - just consider the 'worst case' experienced by the Russian Zsar and his family - shot to death while wearing vests containing precious gems sewn inside them! And while the 6% ROI seemed reasonable rate based on the 'typical' minimum ROI over any post-war 10-year period, a genuine 'worst case' scenario would have used the absolute minimum ROI relevant to my asset mix over the worst 10-year period EVER recorded. Which would have been a negative ROI. That might have given me some pause for thought regarding my 'conservative' levels of gearing. As it turned out, the size of the GFC impact on the values of my stock investments forced my to liquidate many of my stock holdings for less than I'd paid for them, to avoid getting margin calls. Making plans in the mid-noughties it had seemed reasonable to assume that we'd never see another global recession anything like the great depression - after all, modern economies were supposed to be more sophisticated, with better risk management techniques, and more robust, as the 'global economy' was supposed to reduce the impact of a recession in one country. As it turned out, all the market had learned was new ways to boost returns by taking greater and greater risks, and that globalisation in fact meant that problems with one large economy automatically spread to other economies around the world. I haven't bothered updating this chart with new projections, as I have no idea what a realistic 'worst case' is (there are some pundits who think we are waiting for 'the other shoe to drop' and the world may yet see another 'great depression' -- and while I don't expect that will eventuate, I don't think it as unlikely as I had pre-GFC), and I also don't know what the 'best case' might be. I have become somewhat more risk adverse than I was before, so I'll use the proceeds from my maturing capital guaranteed hedge fund investments to reduce my margin loan balances over the next few years. We may also use the proceeds from selling our rental property to pay off most of our home loan. In which case my levels of gearing will be much lower, reducing the potential upside of any future booms in the stock or property markets. Overall, experience has shown that projecting the ROI of high-risk assets is pretty pointless. 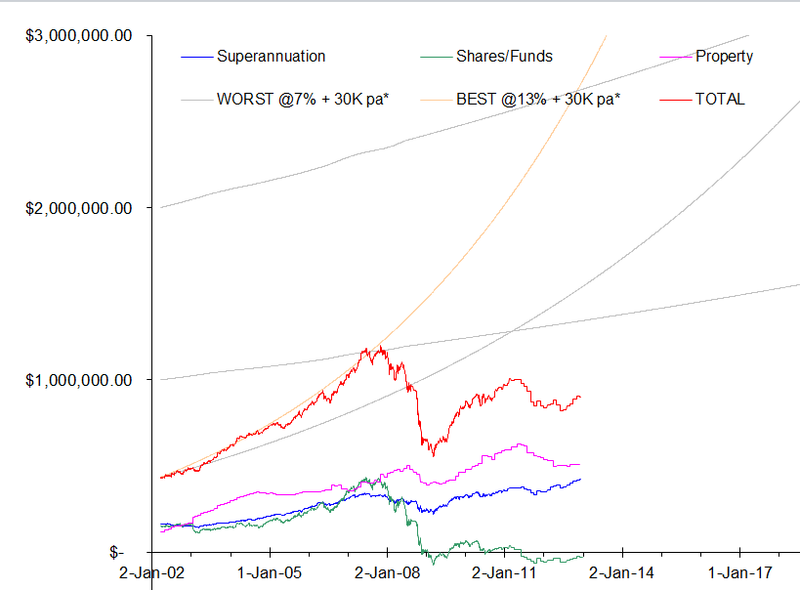 While estimates based on 'average' returns can produce pretty graphs and comforting projections of retirement income and so forth, in reality only no-risk assets (cash and capital-guaranteed deposits) have an ROI predictable enough to make such projections a useful tool. If you want the POTENTIAL for higher returns than those provided by risk-free assets, you have to accept that, in reality, you are basically taking a gamble. While the odds of a decent return may be in your favour, there is no guarantee of any particular ROI, no matter what the historic data suggests. As is often pointed out "All indications of performance returns are historical and can not be relied upon as an indicator for future performance.". Unfortunately, like the health warnings on cigarette packets, it is human nature to become blase about such dire warnings. This is so true. Implied assumptions heavily influence our planning for good or ill.